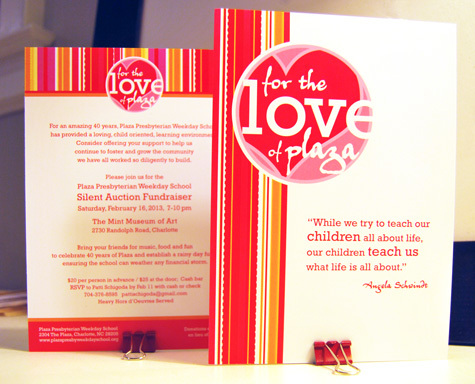 Four years ago, when I was still immersed in my preschool days, I designed a logo and invitation for a (then) new fundraiser for our incredible preschool. It's a fantastic event that celebrates the community and culture of a preschool that is rich in both, provides an opportunity to snag some amazing art and neighborhood gift certificates, and rocks some great music and big fun. Each year, we talk about how to update our invitations, and each year we decide we love the original and use it again.